This weekend will be nuts with all the Holiday Craft Shows going on! Please come to the Westlake school craft fair this Saturday if you can 11 to 4pm! Also there will be a everything under $25 show downtown Santa Cruz in the old Velvet Underground Space on Pacific this Saturday as well. I think that one is from 11 to 5? There is also one in Watsonville Friday through Sunday at the Watsonville fairgrounds I believe??!!!! Check it out! And if you come to the Westlake show, I will be doing glitter tattoos for donations for Muttville Senior Dog rescue!! Remember support your local businesses today for the shop local movement! Shop at your local boutiques and mom and pop type stores! Happy shopping! Everyone have a fantastic Thanksgiving today. I am thankful for all my wonderful customers. I love all the feedback and comments on projects I have created! Two weeks til the holiday show at Westlake School in the upper Westside of Santa Cruz. It’s called the Westlake Winter Artisan’s Fair and is on December 3rd 11 to 4pm Saturday only. I am selling everything $30 and under!!! So come on by!!!!! What ever is left over will be posted to my ETSY page! Gift givin on its way people!!! 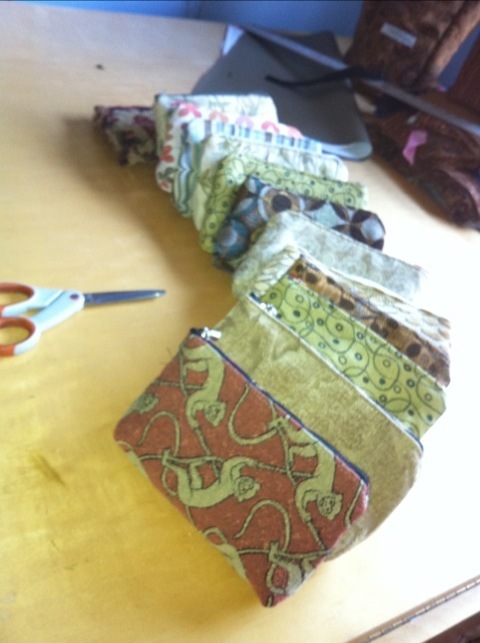 So why not start now and make some Mackerilla bags for gifts! My patterns are easy to follow. I am not a good pattern reader myself so I designed them with someone like me in mind!! I have 12 different ones on ETSY to choose from. I sell them as PDF files but if you want a paper version mailed just ask! I have gone through my closets and picked out a bunch of things to either give to good will or recycle into other items. Old T-shirts are being cut and silkscreened with my gyms logo on them for gym members to sew them on as patches to represent! Old wool sweaters into hats and possibly some cuddly toys or neck warmers. I like this website called . Cool ideas and allot of fun Upcycling inspiration!